American chemist; born at Cincinnati, Ohio, May 23, 1863; son of Solomon Loeb; educated at the New York College of Pharmacy and at the universities of Harvard, Berlin, Heidelberg, and Leipsic. In 1888 he became private assistant to Professor Gibbs of Newport, R. I., and a year later docent at Clark University, Worcester, Mass. He has been professor of chemistry at New York University since 1891, and director of the chemical laboratory there since 1894. 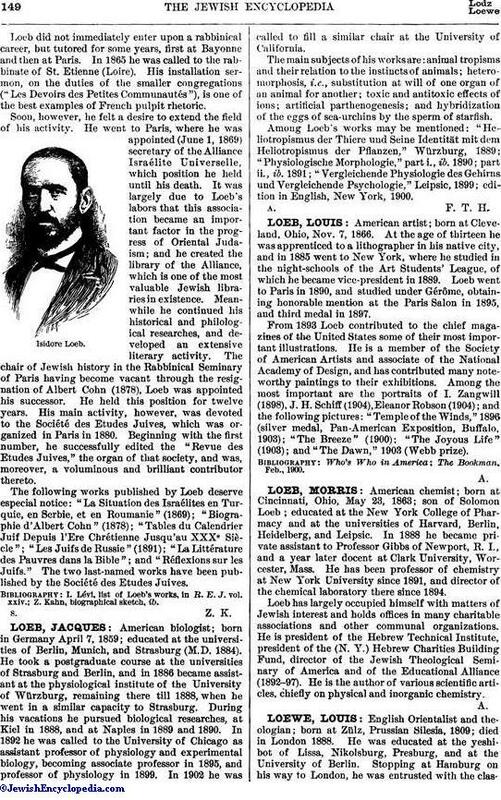 Loeb has largely occupied himself with matters of Jewish interest and holds offices in many charitable associations and other communal organizations. He is president of the Hebrew Technical Institute, president of the (N. Y.) Hebrew Charities Building Fund, director of the Jewish Theological Seminary of America and of the Educational Alliance (1892-97). He is the author of various scientific articles, chiefly on physical and inorganic chemistry.